NEW YORK, Apr. 13, CMC –International credit rating agency, Moody’s Investors Service, has upgraded the Government of Belize’s long-term foreign- and local-currency issuer and senior unsecured ratings to B3 from Caa2, stating that the country’s economic outlook is stable. On Wednesday, Moody’s said the key drivers of the upgrade of Belize’s senior unsecured and long-term issuer ratings are the improvement in the government’s debt service profile and reduction in the risk of a subsequent credit event, following the recent restructuring of the government’s debt. The rating agency said “lingering macroeconomic and fiscal vulnerabilities and risks to debt sustainability, which constrain Belize’s creditworthiness within the low ‘B’ category,” is also a key driver of the upgrade. Concurrent with the rating action, Moody’s has also raised Belize’s long-term foreign-currency bond ceiling to B1 from B2, and the long-term foreign-currency bank deposit ceiling to Caa1 from Caa3. The short-term foreign-currency deposit and bond ceilings remain unchanged at Not Prime (NP), Moody’s said, stating also that the long-term local-currency bond and deposit ceilings have been raised to B1 from B2. It said the March 2017 restructuring constituted the third such credit event since 2006 of the sovereign’s sole external market bond. Under the terms of this latest restructuring, Moody’s noted that amortization payments have now been postponed to begin in 2030, rather than 2019 under the previous terms. “This more benign debt service profile has reduced the risk of a subsequent credit event and the expected loss on Belize’s debt would be lower than is consistent with a ‘Caa’ rating,” it said. 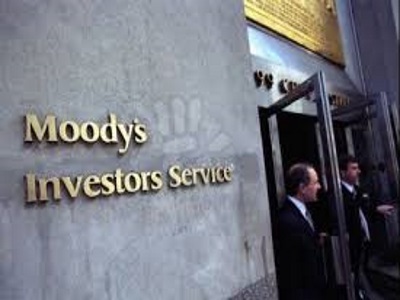 Moody’s said the March restructuring came amid multiple challenges facing the Belizean economy. Rather than two per cent to three per cent real annual average gross domestic product (GDP) growth envisaged then, Moody’s said the economy grew by only one per cent in 2015. During this period, Moody’s said the effective exchange rate appreciated sharply both in nominal and real terms, driven mostly by the strengthening of the US dollar to which the currency is pegged, reducing competitiveness. It said Belize’s fiscal position has weakened, pushing public debt higher. In 2015, Moody’s noted that the overall fiscal deficit widened to nearly 8 percent of GDP partly due to government payments related to the nationalization of two public utilities: Electric company Belize Electricity Limited and telecom company Belize Telemedia Limited. Moody’s estimates that real GDP contracted 1.5 percent in 2016, that the fiscal deficit remained high at around 5 percent of GDP and that central government debt likely reached 91percent of GDP. Moody’s said the stable outlook indicates that rating changes are unlikely in the near future.